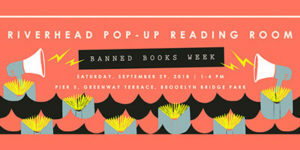 Riverhead Books will host the latest installment of its Pop-Up Reading Room on Saturday, September 29, 1:00 – 4:00 pm at the Brooklyn Bridge Park in support of Banned Books Week. This much anticipated event has been covered in BookRiot and Culture Trip. The open-air, thematically curated reading room will celebrate the freedom to read by featuring books from the Riverhead collection that are frequently challenged in schools and libraries around the country, such as Khaled Hosseini’s acclaimed noveL, THE KITE RUNNER or defy conventional narratives of politics, religion, and sexuality in the form of memoir such as Garrard Conley’s BOY ERASED and Patricia Lockwood’s PRIESTDADDY or socially engaged fiction, such as Mohsin Hamid’s EXIT WEST, Brit Bennett’s THE MOTHERS, and R.O. Kwon’s THE INCENDIARIES. There will also be a selection of books for young readers, courtesy of our friends at Random House Children’s Books and Penguin Young Readers. The pop-up promises an enlightening afternoon of community and conversation. Stop by to read and engage with fellow booklovers about the vital need for literature that generates debate and deeper reflection, amplifying the stories and voices of those that need to be heard today. There will be sponsored snacks and beverages by Harmless Harvest and barkTHINS available on-site, and a chance to win Riverhead totes filled with signed copies of the hottest new books by Riverhead authors Khaled Hosseini (including his latest illustrated book SEA PRAYER), Meg Wolitzer, and Lauren Groff. The last Riverhead Pop-Up Reading Room was an all-day celebration of writing from the Caribbean in honor of Caribbean Heritage Month at the Langston Hughes House in Harlem, featuring a lively conversation with Tiphanie Yanique LAND OF LOVE AND DROWNING about what it means to be a Caribbean-American writer today. For more event information and to RSVP, click here.